Maybe you spent months fixing up that classic car and now you want it to stay just perfect. Maybe you're leaving town and want the comfort of knowing your luxury vehicle is safe and secure. Maybe you've moved and no longer have a parking space for your spare car. Whatever the reason, sometimes you need to find a safe place to keep your car. When storing your car, you need to do a number of things before you park it and walk away. Without considering these items, you could return to find your car with a dead battery, a damaged engine, a flat tire, or damage caused by rodents. Store it indoors – The ideal place to store a car is inside in a climate-controlled location. This keeps your car safe from the elements and at a stable temperature. If you choose to keep your car outside, cover it with a weatherproof car cover to keep the car clean and dry. Wash it up – Be sure to wash the car and clean the wheels and fenders to make sure it is free from mud, grease, or tar. Water stains or bird droppings that are left on the car can damage the paint. For even more protection, wax the car before storing. Change the oil – While not necessary if you're only storing the car for a week or two, change the oil because used engine oil has contaminants that could damage the engine. Fill the tank – Again, if you're only going to be away for a short time, you can skip this step. However, if you're going to be away for 30 days or more, fill the tank to prevent moisture from condensing inside the fuel tank and to prevent the seal from drying out. No brake – Instead of using the parking brake, you can purchase a tire block to prevent the car from moving. Using the parking brake can keep the brake pads in contact with the rotors for too long, which could cause them to fuse together. Prevent critters – Even in climate-controlled environments, pests can find their way into your car and chew on things that will cause damage. To prevent this, cover gaps where mice could enter, like the exhaust pipe. 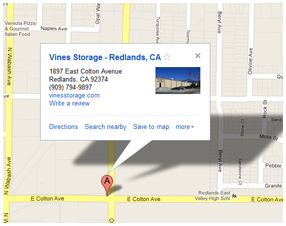 Vines Storage offers great options for storing your car or recreational vehicle. Outdoor self-park storage or indoor climate controlled spots ensure that your car is safe and sound while you're away.